Before we wrote the Ozeri 3x Tower Fan review we had high hopes given its many positive reviews and really stylish design. There are a lot of things to like about this fan and many little features that would make this fan one of the better ones out there. It steps away from the bladeless fan bracket and really embraces the blade fan incorporating the design around the fans themselves. However someone reviewed the fan and mentioned “something must be up with all the positive reviews” and it turns out they were right. Originality is the main ingredient with the design of this fan. It’s unlike all the other tower fans out there in that it has 3 individually controllable fans which is a different route to the bladeless fans that have become popular. They have incorporated this element into the design with the fans being a prominent part of its aesthetics to great effect. With the 3 fans it allows the unit to have a whole lot more options in terms of airflow. A design feature that Ozeri proudly boast is that the Ozeri 3x is one of the thinnest tower fans out there at only 3 inches (7.6cm) wide. The fan sits atop a reinforced glass base which adds a bit of weight to the unit. This is always an important thing with oscillation fans as having the extra weight helps anchor the fan while it oscillates as some fans have been known to wobble around especially on surfaces such as carpets. As a result of the glass weight it does weigh a little heavier than other tower fans because of this, around 6 pounds (2.7kg) heavier than say the Lasko 2551 tower fan. With a carry handle built into the design the fan is easily moved around should you need have the need. Like most other tower fans the Ozeri 3x comes with a 6 foot long (182cm) power cord. Like most tower fans out there this fan does not have any smart capabilities so no wifi/bluetooth/smart app capability. The unit itself has a nice touch screen with icons showing which settings you currently have selected and also a bright blue light near the base. For some this light is far too bright and lights up a bedroom at night past the point of being able to sleep. This was easily covered but the lights on the unit cannot be unless you don’t have any intention of using the remote. The Ozeri 3x fan gets its airflow from the 3 independently controlled canted fan blades. Because each fan is able to be turned on and off separately it allows for more options in regards to the airflow. You can have 1, 2 or 3 fans on at any one time which is a great level of customization to have. It comes with 3 airflow modes which are normal, nature and sleep. Normal mode is as it says, normal. It will oscillate if you have chosen that setting and blow air continuously as per a normal fan. Nature mode is a setting which can be found on a few tower fans and it is an attempt to emulate a natural wind. It works on this fan (if set on high) by cycling through the fan settings from high to medium to low for 5 seconds each. If on medium it will only cycle through medium and low and on low between low and off. Sleep mode cycles through from high to low at 30 minutes on each setting and finishes the cycle on low-speed nature mode. Given you can choose how many fans you have working and the choice of oscillation there is a lot of options on this fan. There isn’t, however, any options to direct the airflow up or down so you will have to hope that it works on the right height for you. The sleep mode is great for those warm nights where you sleep with the fan on but before the room gets too cool the fan will automatically change to a lower setting. No more getting up in the night to change the fan speeds, though there have been issues for some with the amount of noise it makes during the transitions from off to low. Unfortunately, it’s with the fans that the Ozeri 3x has its biggest problem and not one that is a one off or happened just a couple of times. It seems a bit more deep rooted than that. The most common criticism with this fan was that the fans break down and stop working. I’d love to be able to say only a few times but a good majority of the negative reviews we had read encountered had this problem and if it wasn’t the fans breaking it was a screech or a humming noise. There a were a lot of positive reviews though which was a bit odd the deeper we dug into the reviews we started to notice something. Ok, good for you. Except there seem to be a lot of these favorable reviews. In fact if you sort reviews by date on Amazon (at the time of this review) the great majority of these are by customers who have received a discount, gift or free fans. Ironically not one of these people gave less than 5 stars. I’m just not sure who we should be mad at here – the reviewers or the company. So when doing your research on this fan make sure you factor this in as the great customer ratings (on Amazon) are highly inflated with this fan. Most tower fans out there come with 3 wind speed settings and the Ozeri 3x is no exception. There are a few fans out there with more settings but for the most part this is the minimum standard. High, medium and low are the choices you have to deliver your wind flow. You can control all the fans with these speeds however what you cannot do is control the wind speed settings individually for each fan. It’s all or nothing in terms of the speed settings. Given the ability to select each fan individually it gives and extra setting to be able to control noise of the fan. Many tower fans get quite noisy on the highest settings so in this case being able to turn a fan or two off can reduce the sound output a little should you be in the situation you need a bit less noise. Having a fan that oscillates is great for directing airflow around a room rather than directing the flow all in one place. The degree tower fans oscillate is always something buyers comment on so it’s great to be aware of to what degree the fan you might be buying oscillates. The good news is the Ozeri 3x oscillates up to 90 degrees. That is a good level of oscillation and great for spreading the airflow around a room. Timers are pretty much a must have feature for tower fans. As with the oscillation features, the timer settings on different fans differ a lot ranging up to 9 hours at various increments. Like the oscillation feature on this fan the Ozeri 3x offers timer settings that are comparatively quite good. The timer can be set at 30 minute increments up to 7.5 hours which is great compared to a lot of other fans that only have 1 hour or more increments. Like a lot of tower fans though there is no way to be able to tell at what point during the cycle you are (ie 23 minutes in) but better 30 mins than an hour! The timer is a great feature for saving power especially at night time when you want the fan to turn off once you are asleep. With the remote control, all settings of the fan are able to be changed without having to use the base. It works via an infrared signal and has an extended range remote control for those larger rooms which gives you more options in terms of fan placement. Especially if you don’t plan on moving out out your chair or bed. Being an infrared remote however you will still need to be in the line of sight for the remote to work. It can be a little problematic when oscillating as you have to wait until the fan is point back at you to change the settings. The fan has a nice a visual display of the current settings on the unit so you can see which settings you currently have input. A great feature about this fan which many other fans do not have its its ability to remember your settings if the power goes off or it is unplugged. So no messing around trying to get your last setting after a power mishap. When pressing the buttons on the remote or fan base there is a beep. It’s common on most tower fans but can be a bit problematic for those late night fan changes while someone else might be sleeping. If trying to change the settings at night you might run into another issue in that there are no lights on the remote to light it up in the dark which makes it hard to see the buttons. Lucky there are only the 6 buttons so it won’t be hard to recall the position of the settings. Still, not ideal. If you are not using the remote there is a dedicated storage spot on the back of the fan. Powering the remote control is a Lithium CR2032 battery which thankfully comes with the unit upon purchase. Noise is always a big issue for purchasers of tower fans. Tower fans are commonly bought for the use in bedrooms and so often they will be disappointed because the fan they have purchased is not near silent At the same time companies perpetuate the myth that that’s how quiet fans are. Tower fans are not silent and purchasing a tower fan knowing this will make your experience far more pleasant. Of course there are varying degrees of sound with different fans. So how loud is the Ozeri 3x Tower fan? It claims less than 50 DB which is about the same level as a normal conversation. The fan is promoted as having passive noise reduction technology and gives this detailed description on how it works. Eh? You what now? Anyhow, as it turns out this won’t be the quietest fan you ever own probably not the noisiest either. Its pretty much on par with other tower fans in regards to the sound. Ozeri recommends the same method to clean this fan as bladeless fans which is with a vacuum cleaner and brush for the interior parts and a damp cloth for the exterior (never use any cleaning chemicals or liquids as you may damage the unit). Alternative methods for cleaning the insides are with compressed air which works a bit better when your vacuum cannot get to the bits inside. One advantage that the bladeless fans have over the traditional fans is that they have no filters or blades which need cleaning. One could actually see this in two ways. Because there is no need to clean the insides and there is no filter to remove, take those fans apart is a lot more difficult especially if you fan is getting a build up in dirt or dust. This fan however is much easier to pull apart. With some simple DIY you can remove the frame of the fan and get stuck right into the parts of this fan with your compressed air or vacuum for a much more thorough clean. The fan in this review Ozeri 3x OZF3 is designed for a 120v-60Hz electrical supply so always check your power source before purchasing depending on which country you are in. Safety is always important and it’s good to know this tower fan is ETL Listed. One safety feature to note is the fuse on the plug. If for some reason your fan stops working it could be a potential reason. The fuse is rated at 2.5 amps and 125 volts. Along with the safety fuse the fan has a polarized plug to reduce the chance of electric shock. The front of the fans feature a honeycombed grill which prevents small fingers from reaching the fans. 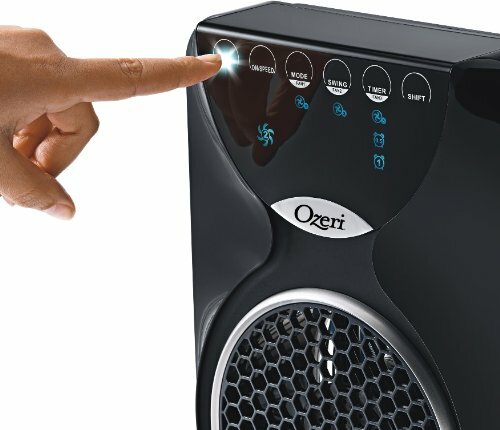 Ozeri claims the fan runs at 90W. Assembly is on the easier side and comes mostly pre made. There is some small amount of assembly required to put the fan together which effectively requires putting the unit in the base and tightening with the nut. It’s important the nut is tight in order to prevent any wobbling of the fan. So what is unique about this fan? Actually quite a bit. The design is very different from other fans. Having the 3 fans which are individually controlled (for the most part) is definitely a unique selling point and very much adds to the customization of the settings. The breeze/nature modes are found on some other fans but certainly not all. The ability to use the timer all the way up to 7.5 hours in just 30 minute increments offers better power saving options than most other fans and the fact it will remember your current settings if the power is suddenly turned off is a big bonus. Control panel visually shows what settings you are on. Remembers your settings if the power is turned off. Fan often develops loud noises in the fans or oscillation. Lights are very bright in a dark room. It is certainly not in the Dyson price bracket but the Ozeri 3x is but is still a good chunk more expensive than the Lasko 2551 or Holmes 36″ so you would be expecting to have a higher quality fan for the extra price. So if you look at the star ratings on Amazon you will see this fan has a lot of great reviews and a very high rating from a lot of people. However as we looked into this we found a lot of these reviews came from customers receiving discounts, fans or gifts in exchange for writing a review. Now it could just be a coincidence that almost everyone of these reviews gave a five star rating or it might not be. We can leave that up to you to determine but still has a lot of good ratings despite this but one has to be concerned about the consistency of the problems in the negative reviews. If this fan was done right it would be a wonderful fan. There might be a whole lot of people out there who do have a good one. It has a really nice design and the ability to control each fan is great, it has some extra features some fans don’t have and the 30 min increments on the timer is great. But the consistent complaints about the fans breaking down is a bit concerning if you are wanting peace of mind. With just the one year warranty for the extra pricing ideally you would want to be covered for longer or you would expect a high quality product. Let’s hope they can fix the issues for the next fan as it is one of the more exciting designed towers fans.